The Prairie Postcards Collection consists of 14,000+ postcards depicting various aspects of life on the Canadian Prairies from the late 19th through the mid 20th centuries. This initial offering was acquired in two stages, and we will continue to add to it as additional Prairie-themed cards are digitized and described. The majority of the cards are individuals. However, there are several ‘booklets’, some of which consist of a set of individual cards together in an ‘envelope’ which is a postcard in its own right, others of which consist of a set of smaller cards that are all attached to each other (and to the ‘main’ card) and fold-out. In both cases, each card has been digitized and described separately, but the connection to the rest of the set has been maintained in the record. The physical collection is housed in the Bruce Peel Special Collections Library and is available to students, staff, and the general public for use within the Library. Each digital postcard is accompanied by metadata, which not only describes the item, but aids in overall searching and browsing of the collection. The metadata for the Prairie Postcard Collection follows the Metadata Object Description Schema (MODS) maintained by the Library of Congress. 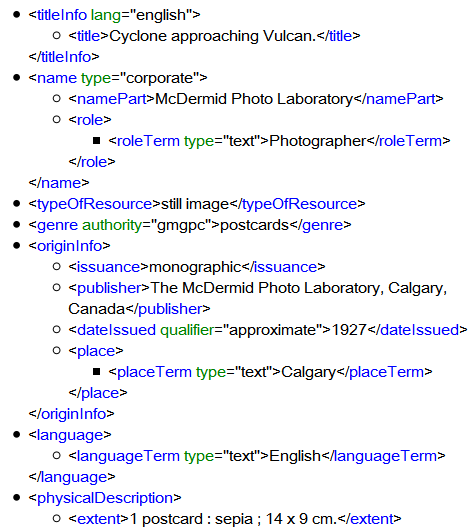 Several controlled vocabularies have been used, including the Library of Congress Thesaurus for Graphic Materials (TGM), the Library of Congress Authorities, the Canadiana Authorities, and Geographical Names of Canada. The image below is an example of some of the metadata for a digitized postcard from the Prairie Postcards Collection. Categorization of the card as a single or part of a booklet, dimensions (in centimetres), and an indication of colour (black & white, colour, or sepia). Example: 1 postcard : b&w ; 9 x 14 cm. Transcription of any hand-written message on the back of the card, if present. (Note: not all messages have been transcribed. See ‘Future Directions’, below, for more detail). Example: From: Uncle B. To: [Master] B.F. Wolstecroft, Dahinda, Sask. "Barry: Will you have a few if I send 'em down? Uncle B." As noted above, not all of the messages found on cards in the collection have been transcribed, which we hope to address in the future. In addition, we hope to enhance the subject description of cards depicting Aboriginal peoples, places and events using the Canadian Subject Headings (CSH). We endeavour to be as accurate and thorough as possible when describing these images. If you have any corrections or additional information, please contact us. A special thanks to our fearless metadata crew (Farzaneh Salehi, Tracy Kitagawa, Brian Stearns, Jennifer Hale, and YCW student Rebecca Schramm) and our Quality Assurance team at Winspear Library (Neda Svob, Cliff Wilkinson and Chris Was).